Norwalk, CT - Fairfield County’s Community Foundation’s (FCCF) launched this year’s Legislative Forums in December in Norwalk and Stamford in 2018 and continued the conversation in Bridgeport at Housatonic Community College and Danbury at Western Connecticut State University this month. 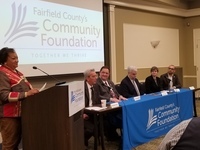 The focus of the forum series was to deepen and strengthen the nonprofit community’s relationships with state and local elected officials while highlighting the Community Foundation’s new strategic work to close the opportunity gap in Fairfield County in collaboration with its nonprofit partners. 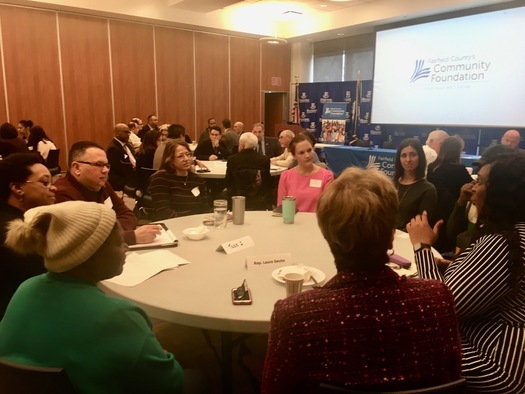 The Community Foundation utilized this gathering of legislative and nonprofit thought leaders to introduce their strategic goals while highlighting FCCF’s core values of equity; diversity and inclusion; collaboration and integrity. The strategic plan aims to create lasting change by preparing high school students to graduate and be prepared for post-secondary education and employment; having older youth and young adults trained with the skills they need to be successful in life; ensure the economic security, health and safety of women and girls and to pursue safe, stable healthy and affordable housing for all Fairfield County residents. The Legislative Forums are annual events for FCCF held across Fairfield County. This year’s forums concentrated on the collaborative opportunity to identify and discuss structural and policy barriers that may impede nonprofits’ work closing the opportunity gap. They were developed to support nonprofit leaders to build relationships, knowledge and skills to make them better advocates for their organizations and the communities they serve. The Bridgeport Legislative Forum held at Housatonic Community College was attended by State Representative Cristin McCarthy Vahey; State Senator Kevin Kelly; State Representative Jack Hennessy; State Representative Laura Devlin; State Representative Joe Gresko; State Representative Steve Stafstrom; State Senator Tony Hwang State Representative; State Representative Jonathan Steinberg; Councilmember Karen Jackson with representatives from nonprofit partners including Kathleen Hunter, Supportive Housing Works; Scott Wilerman, Career Resources, Inc.; Angela Pellegrino-Grant, Career Resources, Inc.; Joseph Sicilia, Connecticut Coalition to End Homelessness; David Rich, Supportive Housing Works; John Heyder, Bridgeport Neighborhood Trust; Brooke Souza	Educators for Excellence; John Torres, Bridgeport Caribe Youth Leaders; Dr. Monette Ferguson,	Action for Bridgeport Community Development, Inc.; George Pamela, Serving All Vessels Equally, Inc.; Deb Jones, Project Morry, Jill Keating Herbst, All Our Kin; Francis Nunez, FaithActs for Education; Rita Appel, Neighborhood Studios of Fairfield County; Laurence Caso, The Klein Memorial Auditorium; Frank Derico	, Neighborhood Studios of Fairfield County; Suzanne Kachmar, City Lights & Company; Hannah Albee, Child and Family Guidance Center; Elaine Harris, Child Advocates of Southwest CT; Michael Patota,	The Child & Family Guidance Center; Stacey Sobel, Child Advocates of Southwest CT; Dawn Hatchett, LifeBridge Community Services; Alan Mathis, LifeBridge Community Services; Maureen Cuda, Bridge House, Inc.; Glen Carpenter, Bridge House, Inc.; Pedro Montalvo, Bridge House, Inc.; Bernie Lynch, Visiting Nurse Services of Connecticut; William Haas, Sacred Heart University; Fiona Hodgson, Housatonic Community College Foundation; Lorraine Gibbons, Cardinal Shehan Center; Ryan O’Connor, Cardinal Shehan Center; Barbara Lopez, Make the Road Connecticut; Leila Coko, Housatonic Community College Foundation; Anna Cruz, Housatonic Community College Foundation and Fairfield County’s Community Foundation Board Members Vincencia Adusei, Joel Green and Preston Tisdale. The Danbury Legislative Forum held at Western Connecticut State University was attended Mayor Mark Boughton; State Representative Richard Smith; State Representative Raghib Allie-Brennan; State Representative Mitch Bolinsky; State Representative Anne Hughes; State Representative Bob Godfrey; State Representative Steve Harding; State Representative Kenneth Guckeralong with representatives from nonprofit partners including Amy Anderson, Community Solutions; Mary Arconti Gregory, Ability Beyond; Kristie Balisciano, The Easterseals Center for Better Hearing ; Christina Calabro,	Western CT Association for Human Rights (WeCAHR); Megan Chrysler,	United Way of Western Connecticut; Dennis Daugherty, SCORE Of Western Connecticut; Terri Eberle Katz, Family & Children’s Aid (FCA); Kevin McNellis, Family & Children’s Aid (FCA); Allison Carballo, Family & Children’s Aid (FCA); Gabriela Hernandez, All Our Kin; Krista Heybruck, Western Connecticut State University ; Yazmin Iglesias,	All Our Kin; Joan Laucius, Danbury Youth Services; Richard Madwid, Catholic Charities of Fairfield County; Yvonne Mora, United Way of Western Connecticut ; Cathie Petroski, Ability Beyond; P.J. Prunty,	The Greater Danbury Chamber of Commerce; Elizabeth Quinonez, United Way of Western Connecticut; Nancy Rebold,	Child Advocates of SW Connecticut; Dew Rosado Torres, The Easterseals Center for Better Hearing; Julie Schmitter, Danbury Youth Services; Stacey Sobel, Child Advocates of SW Connecticut; Kevin Walston, Assistant Superintendent of Danbury Schools; Anne Mead, Danbury Public Schools; Carolyn Silliman, Catholic Charities of Fairfield County; Eileen Costello, EdAdvance; Gail Null, The Regional YMCA of Western Connecticut ; Mark Briggs, The Easterseals Center for Better Hearing; Bryte Johnson, American Cancer Society and Lou Ann Bloomer, The Bridge to Independence and Career Opportunities (TBICO). 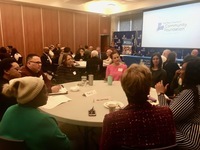 Attendees were invited to have conversations about how the work they are doing is helping to rebuild Connecticut’s economy, as well as, discussing what policies and/or regulations make it challenging for them to do their work. They also had a lively conversation about what type of tools and partnerships they believe would change outcomes in a positive fashion. Questions posed to the legislators included where do you see the greatest opportunity for change and where do you see the greatest challenges in addressing structural and policy barriers. Fairfield County’s Community Foundation has a history of strong relationships with their nonprofit partners, supporting them both financially and providing resources to help them grow and thrive through their Center for Nonprofit Excellence. Established in 2009, Fairfield County’s Community Foundation’s Center for Nonprofit Excellence annually serves approximately 400 local nonprofits developing leaders, improving operations and fostering collaboration.